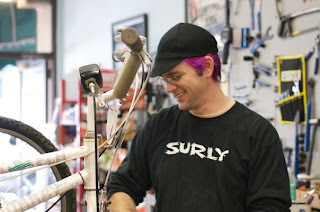 Campbell Street Bicycle Shop: Ask me why my hair is pink. Ask me why my hair is pink. October is National Breast Cancer Awareness Month, and we are trying to raise a little money to help the Susan G Komen Foundation fight this disease that effects so many of us. We will raffle off a bicycle. A pretty sweet cruiser, it’s a Fuji Saratoga 4.0. We are donating it to the cause so all of the money raised will be donated, not just the profits. For just $2.00 a ticket you will be entered into the drawing, which will be held on Nov 1, you will not need be present to win. Also, 10% of any items purchased during the month of October that are pink will be donated as well, this can include lights, computers, bags, and bikes. Our Pink Stock will change from week to week, so stop by and see what we have available..
And yes, we will all be dying our hair pink the boys are particularly looking forward to raising awareness in this particular way. It's a silly tribute to Janet, who before her diagnoses had been dying her hair for so long she claimed have no idea what her real hair color was, I'll post some pics soon. Janet would have loved it, especially the boys. She would have laughed till she cried...I loved it when she did that. Susan Komen is the best breast cancer fund to give to because they use the highest amount of the money on actual work instead of admin costs. How about a nice family picture??? the family pic is working, Tif still needs to dye her hair.